Munich - Rafael van der Vaart at Hamburger SV, Szabolcs Huszti at Hannover 96 and even veteran striker Andriy Voronin at Fortuna Düsseldorf make up probably three of the most high-profile 'returnees' to the Bundesliga this season. Another name that deserves to be on that list is Leon Andreasen, but for very different reasons. "I'm just glad to be able to put everything behind me and am really looking forward to being able to play football again", Andreasen had said ahead of Hannover's recent UEFA Europa league qualifier against St Patrick's Athletic. Andreasen played and scored in the game, ensuring his first appearance for over two seasons was an occasion to savour. The 3-0 win over St Patrick's in June was his first outing for the Reds' senior team since 10 April 2010, when he was replaced by Sofian Chahed after an hour of the Reds' 0-0 draw with Hamburg on Matchday 29 in the 2009/10 Bundesliga season. While the other three names mentioned above might have been enjoying success abroad, Andreasen remained in Hannover the entire time - on the treatment table. The groin problem that forced him off against Hamburg resurfaced multiple times over the next two seasons and required seven separate operations to be corrected. He spent an agonising 28 months on the sidelines battling his way back to fitness, overcoming a mountain of physical and psychological pain to earn a new contract with the club, re-establish himself in the first-team fold and make a desperately long-awaited return to Bundesliga action. 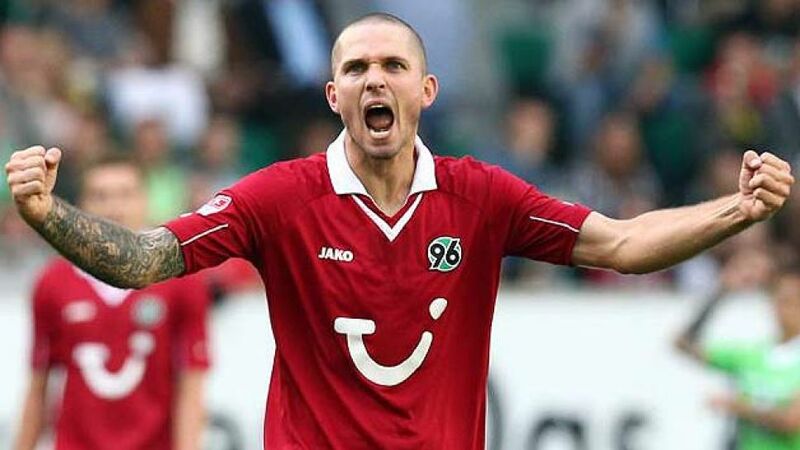 Hannover has not been a quiet place in the months that Andreasen was out injured. Relegation was successfully avoided in 2010 and followed up by a fifth-placed finish in 2011, the club's highest-ever league position, and Europa League qualification. The Reds defied expectations to reach the quarter-finals of the competition last season and ensured consecutive European participation by finishing seventh in 2012. In light of these successes, then, the fact that head coach Mirko Slomka has picked the returning Andreasen to start every game this season is both a testament to his strength of character and an endorsement of his quality as a footballer. After what must have seemed an eternity, the Dane has slotted back into the Hannover midfield as though the wretched injury problems that blighted some of his peak years as a professional had been merely a bad dream. In April 2010, Andreasen was 26 years of age; he is now 29. Yet the fact that two whole seasons have passed him by seems to have barely made a difference to his abilty on the pitch. Slomka clearly believes he has something to offer a competitive Hannover midfield, and his faith has certainly not been misplaced. Andreasen has completed 90 minutes on five occasions this season and even more astonishingly has found the net five times, helping the team to six wins in seven matches. His triumphant return was perhaps crowned on Matchday 2, when he scored in the 4-0 routing of VfL Wolfsburg, his first Bundesliga goal since an effort against Eintracht Frankfurt in March 2010. His form has also earned him a sensational recall to the Denmark national team squad. "After two horrible years, I'm just happy to enjoy whatever comes my way", he said gleefully after the win at Wolfsburg. After the ordeal he has suffered in the last 28 months, the man is simply focused on embracing the second chance he has been given. It's fair to say that he deserves one.